1School of Electrical and Electronic Engineering, University of Manchester, UK. 2School of Physics and Astronomy, University of Manchester, UK. Terahertz light falls between microwave and the infrared in the electromagnetic spectrum, and has the useful property that it can pass through many non-metallic materials, including packaging and clothing. Furthermore, a wealth of material information can be obtained using terahertz waves. As such practical terahertz sources and detectors could be used for security scanning, quality control and wireless communication . 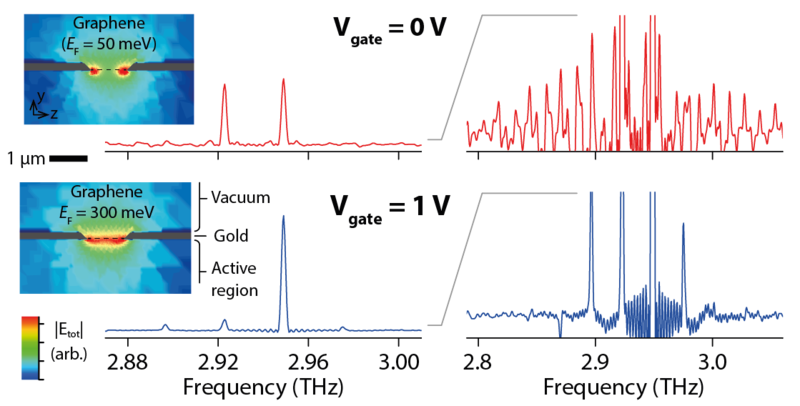 High power terahertz waves can be generated by using quantum cascade lasers. These semiconductor chips contain multiple stacked quantum wells, carefully designed so that the conduction band is split into multiple energy levels in which terahertz light is generated . Controlling quantum cascade lasers so that they produce tuneable, single frequency light is particularly difficult. In our earlier work we achieved all-electrical tuning in a terahertz laser over a discrete set of frequencies . We did this by integrating a specially designed photonic lattice into the gold waveguide of the laser, which we dubbed an ‘aperiodic lattice laser’. Such lasers are compact (~1 cm2), powerful (~10 mW of power), and capable of working at a range of terahertz frequencies. However, to be a practical THz source, these lasers need to show continuous tuning over a wide range of THz frequencies. Figure 1. Graphene integrated laser, showing (from bottom to top) the QCL (Quantum Cascade Laser) chip, the gold grating, the graphene layer, the polymer electrolyte and the top gate. Enters graphene, a single atomic layer of carbon atoms. Graphene interacts strongly with terahertz waves  forming surface plasmons, coupled oscillations between light and the electrons in a material. In graphene the properties of these surface plasmons can be controlled by applying a gate potential to the surface of the device (similar to field effect transistors). This allows graphene to control the properties of a range of optical devices, such as modulators . In our article  we integrate graphene into a terahertz quantum cascade laser, allowing us to use tuneable surface plasmons to control the frequency of laser light. We did this by depositing graphene and a polymer electrolyte gate on top of an aperiodic lattice laser (see figure 1). The aperiodic lattice consists of a series sub-wavelength slits, inside which graphene surface plasmons could be excited. When no gate potential was applied to the graphene, a surface plasmon formed inside the slit to suppress light scattering from the lattice. Conversely when a gate potential was applied to the graphene, the surface plasmon wavelength became larger than the slit width, and scattering was enhanced from the lattice. The effect of this change in scattering strength is to change the laser emission frequency, as defined by the properties of the lattice (see figure 2). Figure 2. 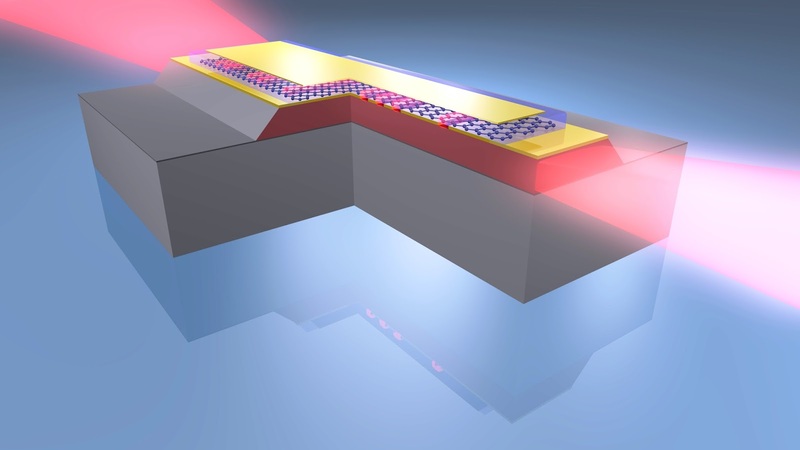 Tuning laser emission using a graphene. The figure shows the simulated electric field in each lattice site, and the laser emission spectrum before and after the introduction of a gate potential. This result shows that graphene plasmons can be excited and used to tune terahertz lasers. Although currently a proof of concept, it is in principle possible to individually gate each slit, allowing us to engineer the laser output. Such control would make terahertz lasers significantly more appealing for real world applications. Furthermore, although the design approach used in our work is most suitable for terahertz lasers, they could in principle be applied to more conventional lasers in the infrared. This would offer an entirely different way of controlling the properties of laser systems. A. Giles Davies, Andrew D. Burnett, Wenhui Fan, Edmund H. Linfield, John E. Cunningham, "Terahertz spectroscopy of explosives and drugs", Materials Today, 11, 18–26 (2008). Full PDF. Rüdeger Köhler, Alessandro Tredicucci, Fabio Beltram, Harvey E. Beere, Edmund H. Linfield, A. Giles Davies, David A. Ritchie, Rita C. Iotti, Fausto Rossi, "Terahertz semiconductor-heterostructure laser", Nature, 417, 156–9 (2002). Abstract. Subhasish Chakraborty, Owen Marshall, Chen Wei Hsin, Md. Khairuzzaman, Harvey Beere, David Ritchie, "Discrete mode tuning in terahertz quantum cascade lasers", Optics Express, 20, B306–14 (2012). Abstract. Alessandro Tredicucci, Miriam Serena Vitiello, "Device Concepts for Graphene-Based Terahertz Photonics", IEEE Journal for Selected Topics in Quantum Electronics, 20, 130–138 (2014). Full Article. A. N. Grigorenko, M. Polini, K. S. Novoselov, "Graphene plasmonics", Nature Photonics, 6, 749–758 (2012). Abstract. S. Chakraborty, O. P. Marshall, T. G. Folland, Y.-J. Kim, A. N. Grigorenko, K. S. Novoselov, "Gain modulation by graphene plasmons in aperiodic lattice lasers", Science, 351, 246–248 (2016). Abstract.